Add water to a pot and bring to a boil. Add eggs to the pot, and cook for approx. 6 – 7 min., rinse under cold water afterwards and set aside. Wash spinach and cilantro and remove stems, if needed. Dry and set aside. Peel and dice avocado. Add avocado dices, spinach, and cilantro to a bowl. Zest and juice lime. Add toasted sesame oil, lime juice and zest, salt, and pepper to a bowl and stir well. Add dressing to the salad and toss to combine. Crack remaining egg into a bowl and give it a quick beat. Add breadcrumbs together with sesame seeds to another bowl. Peel the cooked, cooled eggs and dredge in breadcrumb-sesame mixture, then in egg coating and in breadcrumbs once more. Heat vegetable oil in a small pot. Carefully add coated eggs to the pot and fry, until golden brown and crispy. Remove with a slotted spoon. 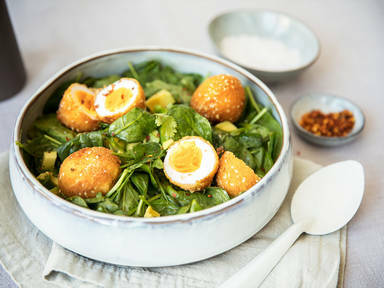 Serve salad and place fried eggs on top. Season with salt, pepper, and chili flakes to taste and enjoy!